If you don’t use your garage for your car, you’re not alone. Most people use their garages for everything from storage to home gyms, workshops, and more. However, if you’re not currently using your garage for your car due to a problem with your garage door opener or a problem with your garage door track, don’t hesitate to call Garage Door Doctor to repair your garage door if you’re in the Indianapolis area. Once your garage door has been repaired, you’ll be ready to use your garage for your car once again! However, you’ll probably also need to organize your garage. 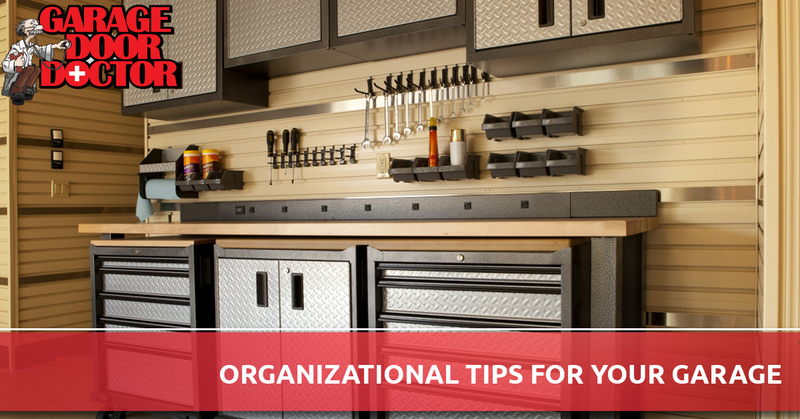 Keep reading for some of our top organizational tips for your garage! The easiest way to organize things is to begin by going through everything, and throwing away the things that you don’t need or want. It can be easy to go through a box of your belongings and think that you will use something eventually or you may find a purpose for a certain item, so it’s best to keep it. However, we all know that the item will most likely continue sitting in your garage, waiting until the next time you decide to clean things out. If you haven’t used an item in your garage at least once in the last year, you should probably either donate it, sell it, or throw it away. There are certain items that you shouldn’t be keeping in your garage to begin with. Paint, for example, can be ruined if subjected to extreme temperatures. Propane tanks are another item that you should not keep in your garage, as a spark from your car or a tool could ignite a fire. Cleaning out your garage is usually a good time to re-examine where you’re keeping certain items, and if the garage is really the best place for them. Now may be a good time to clean out your crawl-space and basement as well, so you can have more room inside your home to store things if needed. You may also want to consider getting a storage shed for your yard if one will fit. Items you choose to store in your garage should not be kept in boxes or tubs on the ground. To maximize the space in your garage for storage, you’ll want to install shelves and cabinets on the walls of your garage to store items. You will be able to better organize your items when they have a designated space, and it will make it feel like you have more room for storage in your garage. Keeping your items off of the ground in the garage will also protect your belongings in case of a flood. Clear, plastic storage containers are also ideal since for the garage as they are water-resistant and you can easily see what you have stored in them. Organizing your garage will not only give you a little more peace of mind in knowing that you will be able to easily find items that you need, but you’ll also have space in your garage once again to park your car. If your garage door is in need of repairs or replacement so you can effectively use your garage again, call the professionals at Garage Door Doctor in Indianapolis.